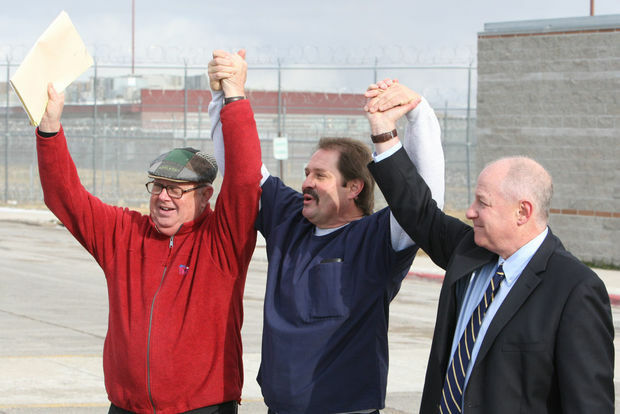 At long last…Barry Beach has received clemency from Gov. Steve Bullock. He was released from prison on Friday, November 20, 2015. Congrats to him and his family, and may they have a much brighter future. After serving nearly 30 years for a crime he did not commit, Barry Beach was released on his own recognizance pending a new trial on December 7, 2011. The Honorable Judge E. Wayne Phillips ordered the release after hearing new eyewitness testimony that casts serious and more than reasonable doubt as to Barry Beach’s involvement in the 1979 murder of Kimberly Nees in Poplar, Montana. Judge Phillips stated that had a jury heard this new evidence at the original 1984 trial, they would not have convicted Barry. During his new-found freedom, Barry displayed an amazing aptitude for adapting to his new environment. Despite the years of incarceration, Barry made friends everywhere he went, spoke freely and honestly to strangers and crowds about the miracles God had worked in his life, performed numerous services that benefitted others and the community of Billings, Montana, and was openly accepted by that community. On May 13th of 2013, the Montana Supreme Court issued a very narrowly split decision reversing the district court’s order and placing Barry Beach back in prison. Barry, accepting everything this meant for him, turned himself over to authorities of his own free will and was taken back to the Montana State Prison in Deer Lodge. Montanans For Justice was saddened and outraged to learn of this recurring injustice to Barry Beach. MFJ had worked countless hours beside Centurion Ministries and Barry’s legal team fighting for his freedom. We have vowed to continue to fight for his full exoneration. This website is designed to continue to be a resource for factual information concerning the 1979 murder of Kim Nees and Barry Beach’s exoneration, but also serves as a testament to the positive impact Barry Beach has made upon the lives of so many people throughout the United States, but especially Montana and the Billings community. Please join Montanans For Justice in our mission to seek Justice for Kim Nees, and exoneration for Barry Beach. Get involved by proclaiming your outrage at this injustice and by supporting our efforts. We will do our best to keep you informed as to all the current efforts and any news as it arises. Thank you in advance for your time and your interest in correcting this injustice.